While vacations offer the opportunity to sightsee, spend time with family and friends, or do some solo adventuring, they can sometimes cause stress and anxiety. Perhaps you are traveling with rowdy children in a small car, maybe you fall ill in an unfamiliar place, can’t get a wink of sleep, or you’re rocking a painful sunburn. Whatever your conundrum, there are powerful essential oils and botanical remedies that can assuage any anxiety, support sleep, and even make that burn feel better in the morning. Below are five must-have multitasking essential oils to pack no matter where your summer travels take you! For me, planes are too cold and stuffy. In fact, the air in planes is actually drier than the Sahara Desert, making it the ideal locale for coming down with a cold. If you’re prone to catching things easily when traveling, rosalina is an oil to take on all of your journeys. Known as lavender tea tree, this oil makes the list not only because it’s a go-to for coughs and colds but also because it’s safe to use (properly diluted) on and around children. Rosalina contains two notable chemicals: 1,8 cineole and linalool; 1,8 cineole is effective at ridding mucus and supporting respiratory functioning, and linalool is known to have a sedating and soothing effect. This antibacterial and immune-supporting oil also has an often-beloved scent—sweet and camphoraceous. How-To: Add 10 drops rosalina and 5 drops lavender to an aromatic inhaler. Give to children (or yourself) to inhale for calming, or use when nasally congested. Afraid of flying? Anxious to be away from home? Fear the worst-case scenario in an unknown land? If you have travel anxiety, you’re not alone. Nearly 20 percent of Americans suffer from anxiety, which can get in the way of enjoying a trip. Distilled from the roots, vetiver is incredibly grounding and boasts an earthy aroma—there is even preliminary research suggesting that inhalation reduces anxiety. Vetiver is also safe to use with children and is particularly useful for those diagnosed with ADD and ADHD. How-To: Create a travel ritual to lessen anxiety. Add 3 drops vetiver, 5 drops lavender, and 8 drops sweet orange to an ounce of sunflower oil. Anoint on pulse points before and/or during travel when feeling overwhelmed. Few admit it, but many experience it when traveling. What am I? Constipation! If you suffer from IBS discomfort and backed-up bowels, join the club. Many travelers are unable to easily “go” when away from the luxury of their homes and routines. If this feeling rings true for you, pack some ginger. The fresh and spicy aroma is known for kick-starting digestion and movement. Recent research highlights that ginger is indeed gastro-protective. Like peppermint, ginger can also assuage motion sickness and nausea and is gentle enough to use on children with stomach issues. How-To: Relax abdominal muscles with a warming massage blend. Add 6 drops ginger and 3 drops fennel to an ounce of sesame oil. Massage on lower abdomen as necessary. If you are traveling anywhere—beach, mountains, city—lavender needs to be in your bag. This essential oil helps you get to sleep faster, relieves sunburn, takes the itch out of bug bites, makes a wonderfully delicate perfume, and so much more. I never travel without my lavender. And if I could only take one oil on a trip, this would be it. A renowned antimicrobial and skin healer, lavender accelerates the healing of wounds and burns. It has also been clinically shown to reduce pain in burn patients. Got sunburn and need some potent all-natural relief? Use lavender. It’s also great for healing cuts and scrapes on both adults and kids. How-To: For an adult, add a few drops of lavender neat—directly on any sunburn or non-opened bug bite. Traveling in unbearable heat? Try cooling off with a spritz of lavender hydrosol or any of these high-tech face mists. This oil is conceivably the dark horse in the bunch since it’s not an incredibly well-known essential oil in the aromatherapy world. But if you have agonizing jet lag and are not able to effortlessly regulate your body’s biological cycles to a new time zone, fragonia will be your new best friend. Fragonia helps restore the body’s natural balance. Interestingly enough, the therapeutic benefits of recalibrating and harmonizing the body and mind are also reflected in its nearly 1:1:1 chemical ratio of oxides, monoterpenes, and monoterpenols—giving us the gift of an extremely well-rounded oil. How-To: Upon landing in a different time zone, add a few drops of fragonia to the back of your neck and pulse points. Combine with roman chamomile to aid in sleep or pink grapefruit to maintain alertness and fight the urge to sleep. When one is taught about mindfulness, meditation, and yoga, smell is rarely mentioned. Nowadays, with immense focus on the physical practice, smelling is easily overlooked by those searching to go deeper into contemplative practices. Our noses know the powerfully compelling films of memories to play in our minds, alerting us of threats in the environment, spoiling us with warmth and comfort, and ultimately becoming a part of our identities. Incorporating scent into your meditation or yoga routine can truly transform your practice. Throughout history, aromas have been used in medical, spiritual, and cosmetic rituals to calm the mind, connect with higher consciousness, and beautify. Ancient Egyptians adored fragrance and used spikenard, frankincense, and cassia to ritualize this life and pay homage to the next one. Ancient Greeks viewed perfumes and oils as gifts from the gods, offering them up in holy worship rituals. Tibetan Buddhists even added juniper berries to incense to aid in achieving meditative states. As history shows, aroma is a powerful transporter of mind, body, and spirit. Incorporate some sacred scents into your own ritual! Here are five essential oils that will certainly add a new element to your mindful practice. This oil is a go-to for diving deeper into spiritual practices. Often used in meditation blends, frankincense is renowned for supporting reflection and introspection—the name frankincense even comes from the French word meaning “pure incense.” Beyond its renowned Judeo-Christian uses, frankincense is also incorporated into Shinto meditation rituals in Japan. The woody, otherworldly aroma soothes the spirit and blends well with lavender, cistus, and myrrh. Beyond having deep roots in mystical rituals, frankincense has an affinity for healing the skin and supporting compromised immunity. How-To: To promote serenity, use in a prayer blend. Add 5 drops to an ounce of sesame oil and anoint on pulse points before or while engaging in spiritual practice. Also known as Australian Desert Rosewood, the viscous oil is distilled from a small tree native to Australia. The aroma has hints of sandalwood and rose. If you’re looking for a grounding oil that isn’t vetiver, try Buddha wood. The smoky and mossy aroma is well-balanced and promotes harmony and inner peace. Is your intention to be more present? Reach for this. How-To: Are you a yogi? Zen out with a Shavasana blend. Add a drop or two into an aromatic diffuser—it blends well with sandalwood, patchouli, and sweet orange. If your oil is too thick for diffusing, try adding it to a relaxing aromatic spritzer instead. Sometimes called Jatamansi, this oil hails from the Alpine Himalayas and has long been used in ayurvedic and Unani medicine. It is sometimes used in anointing rituals in ancient Persia and Turkey. The oil is distilled from the roots, and the aroma is truly full-bodied and powerfully earthy. A nervous system sedative that has a deeply tranquilizing effect, Spikenard is a great addition to relaxation and sleep blends. Beyond that, it works on a more subtle energetic level of healing. Looking to encourage some compassion for yourself or others? Are you looking inward to encourage forgiveness? Spikenard can help. How-To: Use in a sleep blend. Create a bedtime ritual that promotes sleep and calms the mind. Add 3 drops to 1 ounce of jojoba. Feel free to blend with lavender and roman chamomile and anoint on pulse points before sleep. Palo Santo means “sacred wood,” which makes it fitting to incorporate into a mindful practice custom. For years, this oil and wood has been used and worshipped by Incas and Andean shamans for its healing properties. It’s distilled from dead wood fallen off the tree, and the aroma is musky but crisp. The smell alone uplifts and provides expansion in the mind’s eye. Often used in meditation, Palo Santo is said to enhance creativity and help sustain attention. How-To: Looking to explore new meditations or spiritual practices? Add 7 drops Palo Santo to an aromatic inhaler and use when trying a new activity. I’ve recently done this while trying qigong! I’ve found that it helps open the heart and mind and provides a sense of security when trying something different. Perhaps one of my favorite essential oils, galbanum is truly sacred. Its resinous, exotic aroma takes you back in time. Common in Old World rituals, it’s mentioned in the Bible and in the writings of Hippocrates. Nowadays, you can get whiffs of galbanum in modern perfumes by luxury designers like Cartier and Balmain. Lauded for being protective and purifying, galbanum is a go-to oil for meditation—particularly for letting go of past hurt and trauma. How-To: Simply smell before dropping into a healing meditation, or add galbanum to a meditation blend. It blends well with elemi and frankincense. 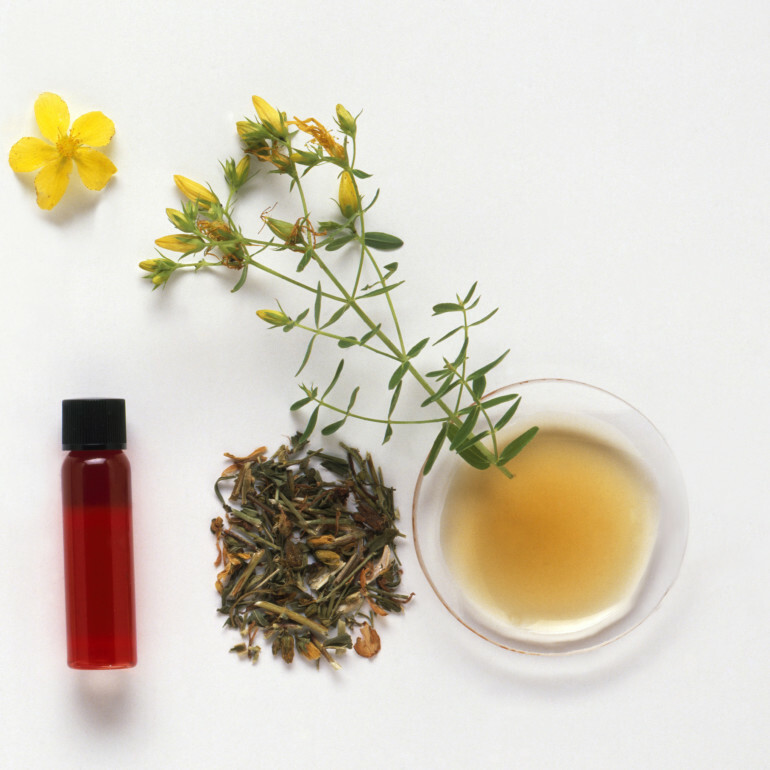 Are you looking to infuse some nature into your skin-care routine? 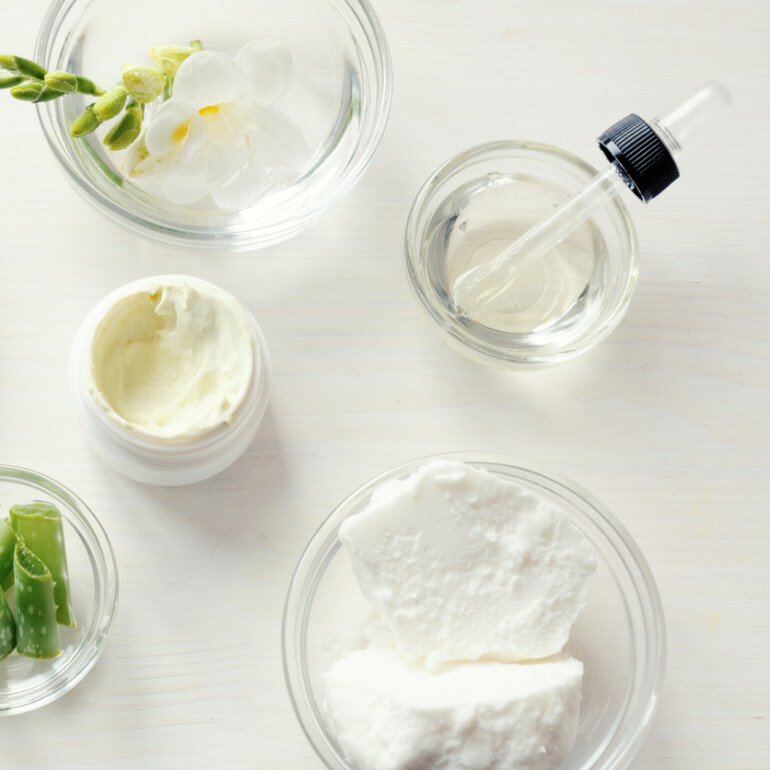 With a little bit of knowledge, you can customize products to fit your skin’s needs. Do you know what’s in your current products? If they’re filled with parabens, synthetic fragrances, phthalates, and SLS/SLES, perhaps it’s time to re-evaluate what’s going on your skin. In fact, shedding light on current practices and lack of regulation in the beauty and skin-care industries may come as quite the shock. Do you use products that cite “fragrance” or “parfum” in the ingredients? It’s common practice, which actually allows manufacturers to legally conceal toxic and harmful components. Plus, popular foaming ingredients SLS and SLES are known irritants and can be included without informing consumers. To make matters worse, a by-product of SLS/SLES manufacturing is 1,4 dioxane—a substance that may affect the CNS, kidneys, and liver. Oh, and it may be carcinogenic. Looking to combat fine lines and aging? Carrot seed is a must-have for cell regeneration. 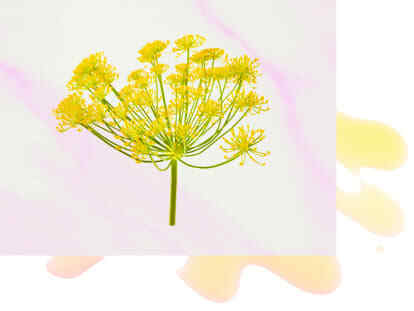 This oil originates from Europe and is distilled from dried seeds of Queen Anne’s Lace. Clinically demonstrated as a powerful antibacterial and antifungal agent, it’s still gentle and nourishing for the thin skin of the face. The warm and spicy aroma adds a unique kick to a face serum and blends well with other youth-boosting oils like helichrysum, lavender, and yarrow. It can even be used to aid in scar reduction. Best for: Mature and wrinkled skin, broken capillaries, age spots, eczema. Known as Everlast or Immortelle, this essential oil—with a charming, herbaceous aroma—is my absolute favorite. In fact, it’s in my daily face moisturizer. Got tissue trauma? Helichrysum is the oil to use. Because it’s a relatively new essential oil on the aromatherapy scene, there is little clinical evidence in support of its therapeutic benefits for skin, but just a few uses will make you believe in its magic. It blends well with other skin-loving oils like cistus, carrot seed, and lavender. Best for: Bruises, burns, dry and itchy skin, acne, sun-damaged skin. If your skin needs TLC, indulge with exquisite rose. Dubbed the “Queen of Flowers” in 600 B.C. by poet Sappho, rose is a nourishing floral oil that’s a powerful skin healer. This essential oil is cool in nature, and dermal application has been shown to exhibit a relaxing effect—decreasing systolic blood pressure and autonomic arousal. Rose blends well with many other essential oils on this list as well as geranium, neroli, and sandalwood. It adds a lush, feminine vibe to any skin-care routine. Best for: Rosacea and blotchy skin, oily skin (astringent), easily agitated skin, mature skin, preventive and general skin care. No matter your skin type, lavender can help soothe your skin woes. An incredibly balanced oil, it harmonizes and blends well with many other skin-supporting essential oils. One of the most commonly used essential oils, lavender is multifaceted and renowned for its healing properties. Got a burn? Be it from a razor, the stove, or sun, a little bit of lavender goes a long way. Even the father of modern aromatherapy, René-Maurice Gattefossé, anecdotally attested to lavender’s healing power post-skin-burn. Perhaps you have irksome bug bites or an allergic reaction that’s manifesting on your skin? Lavender will likely help. It also helps fight the principal bacteria involved in acne. Best for: Sunburn, psoriasis and inflamed skin, insect bites and hives, razor burn, open and slow-healing sores. Often overshadowed by its botanical cousin frankincense, myrrh has a rich history in skin care and spiritual routines. Myrrh was used in the purification ritual of women who were presented before King Ahasuerus of the Medes and Persians, and it has also been used in TCM as a wound healer. Recent evidence shows that myrrh may help accelerate immune response to skin healing, which makes it an ideal vulnerary. Distilled from the resin, myrrh boasts a balsamic and warm aroma that blends well with rose and lavender. Also known as rock rose, this essential oil is distilled from dried leaves of a plant native to the western Mediterranean. It’s not too highly touted, but I’m just waiting for this essential oil is to dominate the natural beauty scene. The sweet and fresh aroma blends well with just about every essential oil on this list and is a known antibacterial agent. Ideal for first aid treatment and broken skin wounds, this oil also lends support for those battling autoimmune disorders. Related: Essential Oils That Beat Brain Fog + Boost Energy? Heck, Yes! Runny nose? Watery eyes? Sinus congestion? Contrary to popular belief, allergies can be a year-round pain and may not be limited to a particular season, like spring. But allergy sufferers know this all too well. If allergies keep you from living the life you want and over-the-counter products don’t seem to do the trick, then maybe the ancient practice of aromatic plant medicine will help you breathe better than ever before. There are many key oils with an affinity for the respiratory tract (lavender, tea tree, and rosemary, to name a few); however, some may not be familiar to those who aren’t immersed in the world of aromatherapy. When looking for aromatherapy oils to treat seasonal allergies, it’s helpful to search for oils that are antispasmodic, anti-inflammatory, astringent, and antitussive (aids with coughing). For ideal healing, identify your needs and symptoms and see what essential oil fits your profile! 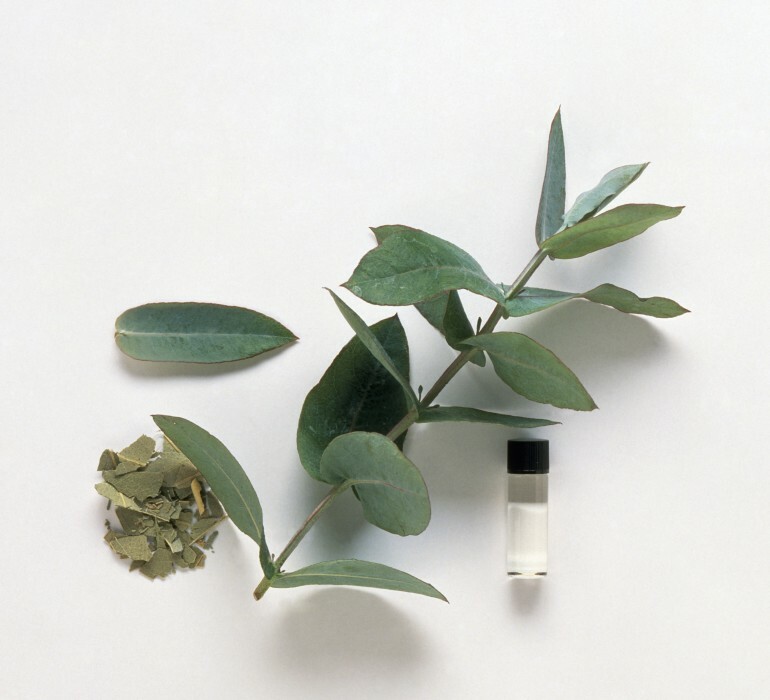 Hailing from the myrtaceae family, eucalyptus radiata has a less aggressive scent than blue gum eucalyptus, so you can use low dilutions for children and the elderly. This immune-enhancing essential oil is an upper-respiratory tonic that can help alleviate sinusitis (sinus infection). Fun fact: The plant is also known as the narrow-leaved peppermint! How-to: No time to waste and need a quick remedy? Take 2 tablespoons of pure almond oil or olive oil and mix 4 to 5 drops of eucalyptus essential oil into it. Rub this blend on your throat, cheeks, neck, back, and temples to relieve congestion. Cover yourself up with a T-shirt after applying the massage oil for best results. Got postnasal drip? The average person produces 1 to 1.5 mL of mucus a day, and that’s healthy since it protects our bodies by trapping foreign objects. But too much of it can leave you feeling stuffy and uncomfortable, so rosalina (known as the lavender tea tree) can help as a calming central nervous system tonic. How-to: Just add a few drops of rosalina to your bathwater and let it work magic on you. The moist air you inhale helps heal sinus and chest congestion, loosen the mucus, unblock nasal pathways, and cleanse the body of microbes. Having difficulty breathing? Green myrtle will increase your uptake of oxygen. Known as an herb of protection that wards off the “evil eye,” green myrtle is gentle and can be used to help quell asthma spells. It’s also a powerful anti-catarrhal (helps the body remove excess mucus), antispasmodic, and expectorant. How-to: Make a DIY chest balm with either ½ a cup of coconut oil or ½ a cup of shea butter. Mix the primary ingredient with about 2 teaspoons of almond oil and 10 drops of green myrtle oil. Massage this on your chest, on your neck, temples, and behind the neck for instant relief. Always cover yourself after applying a balm. A balsamic, calming scent, frankincense is great for watery eyes or if you are looking to dry out your nasal passages and excessive mucus. It soothes the nervous system and has historically been the oil of choice when one needed a Band-Aid and help with poison ivy. Try mixing it with rosalina before sleeping—I’m a big fan of this calming, clearing combo! How-to: All you need is a few tissues! Just put a few drops of earthy frankincense directly on your tissue and inhale every now and then. To sleep peacefully and breathe better at night, put a few drops of the oil on your pillow. If you have strong allergies, German chamomile is worth exploring. In ancient times, it was used for colic, indigestion, insomnia, and toothaches. 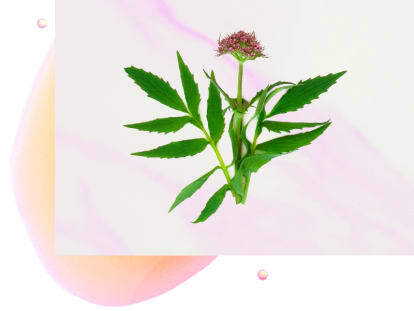 Nowadays, this greenish-blue powerhouse is an antispasmodic, carminative, and wound-healing essential oil—essential when allergies are getting the best of you. How-to: Create a therapeutic steam of chamomile oil, and add 4 to 5 drops of the oil to a steamer or big bowl. Cover the lid and place a towel on your head, covering the steamer, or just sit over a bowl for 5 to 10 minutes. While these essential oils are extremely powerful with just a sniff or dab on the wrists and inhalation, there are ways to get more out of the experience. Firstly, diaphragmatic breathing can be effective to help open the nasal passages and get the most benefit from aromatherapy—the diaphragm is the most efficient breathing muscle and it sits right at the base of the lungs. Before engaging in diaphragmatic breathing, place your index and middle fingers between your cheekbone and teeth bones (on both sides of the face)—this will help open the nasal passages by acupressure. Another one of my go-to techniques for easier breathing is nadi shodhana, aka, alternate nostril breathing. Take your right hand; bring your pointer finger and middle finger to rest between your eyebrows. Close your eyes and take a deep breath in and out through your nose. Then, close your right nostril with your right thumb. Inhale through the left nostril slowly. Close the left nostril with your ring finger so both nostrils are held closed; retain your breath at the top of the inhale for a few seconds. Open your right nostril and release the breath slowly through the right side; pause briefly at the bottom of the exhale. Take about 3 to 5 breaths alternating nostrils and feel your nervous system rejuvenate. There’s no debate here—losing weight requires mindful eating and active exercise. While it’s easy to promote healthy lifestyle changes, what’s much harder is psychologically understanding and maintaining behavior. Inundated with high-tech apps and gadgets promising to keep us on track with healthy snacking and fitness regimes, returning to nature may be just what we need. After all, it only takes one whiff of an aroma to rewire the brain. Food cravings are complicated. In fact, neuroscientists have yet to fully understand their root causes! Some experts posit that sugary foods lead to more intense cravings because glucose communicates with brain receptors that can trigger addiction. While the jury is out, recent research has demonstrated that smelling odors, like eucalyptus, actually reduces food cravings. If motivation is low and you’re in dire need of inspiration, then consider yourself lucky. Though often overlooked, aromatherapy is effective at breaking old habits and helping you commit to new ones. With scent, we can condition ourselves to behave in certain ways. Regardless of whether your cravings stem from boredom, depression, or addiction, below are six essential oils that will curb any craving and keep your weight-loss goals on track! Consider yourself an emotional stress eater? Smell some peppermint. 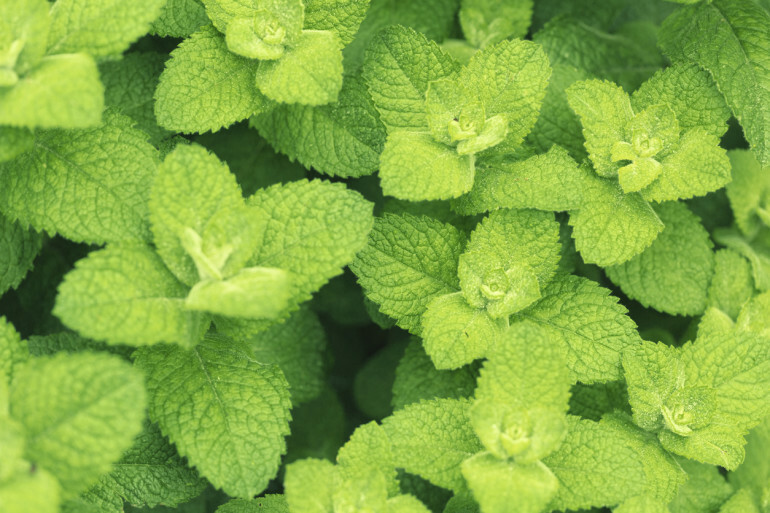 What some have intuitively known for a long time—that refreshing, minty aroma helps evade cravings—is also demonstrated in clinical research. In one study, participants who sniffed peppermint throughout the day showed decreased appetites, decreased hunger cravings, and even consumed fewer calories. And if you’re sold on peppermint, use it in conjunction with some of mbg’s tips to stop emotional eating in its tracks. How-To: Diffuse some peppermint throughout your day (not around children), or add a few drops to an aromatherapy inhaler and smell when stressed. 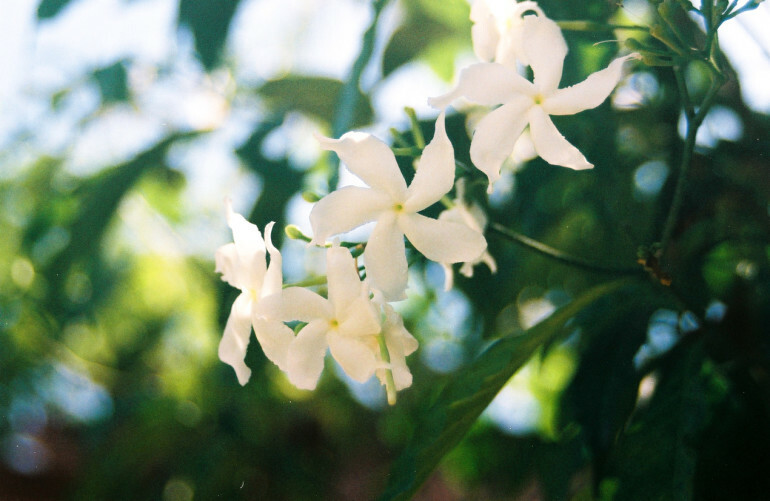 Oh lovely, floral jasmine. Just smelling this essential oil eases a frazzled mind and can boost your spirit. Can’t stop thinking about chocolate? Reach for jasmine. Its sweet aroma has been shown to effectively tame chocolate cravings. How-To: Due to the steep price, inhaling directly from the bottle will do the trick. My go-to is dabbing a smidgen of jasmine with ylang-ylang on the wrists. Sometimes we munch or crave foods because we’re bored or feeling down. We’ve all been there! When this happens, refreshing grapefruit can muster the energy we need to get moving and put down the junk food. In fact, preliminary research shows that grapefruit scent suppresses appetite and may even help keep off weight. How-To: Add 12 drops to an aromatherapy inhaler and use throughout the day (before and after meals) to uplift your mood and associate the scent with satiation. This essential oil deserves more time in the spotlight. The full-bodied and fiery aroma is an energizing stimulator that will take your mind off any piece of candy. In one clinical study, inhalation of black pepper decreased the level of nicotine craving. Something about its energy inspires movement while also providing deeply grounding roots. 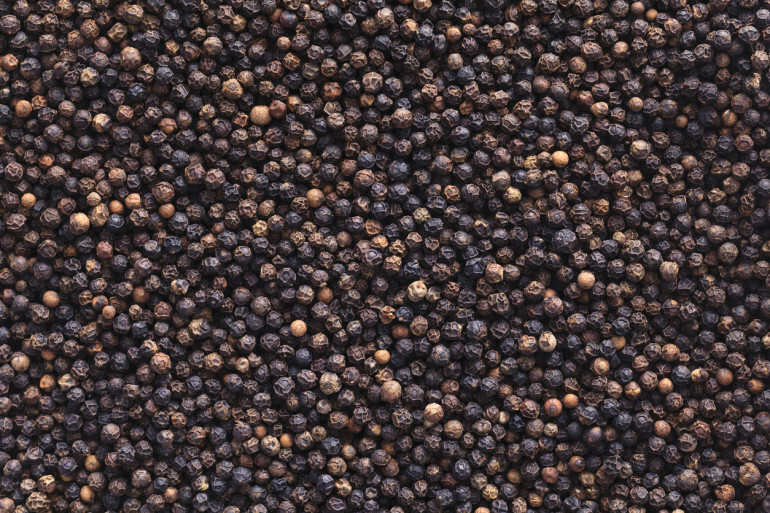 How-To: Black pepper is not always ideal for topical use because it can sometimes irritate skin. Therefore, just add a drop to a cotton ball and inhale anytime you feel overwhelmed with craving. Do this every time you crave a certain food, and it will condition your mind to move along. 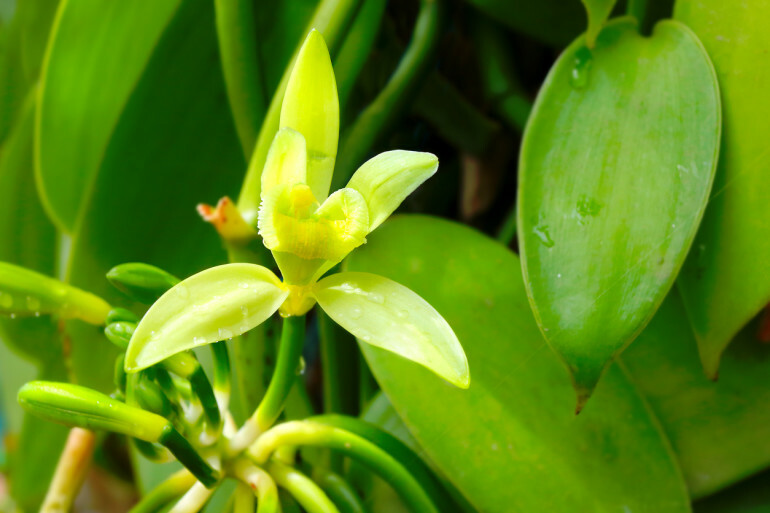 Though vanilla is not an essential oil but rather a CO2 extract, it’s still used effectively in aromatherapy. Vanilla has a sweet, exotic aroma that comforts the soul. So you’d think the smell would make you crave dessert, right? Research tells us that’s not the case. In fact, those instructed to smell vanilla when hungry for a snack reported reduced sweets cravings and even lost weight over the span of a month. How-To: Add some vanilla to your perfume. A personal favorite treat of mine is using vanilla-infused jojoba oil as my base. Check out this guide on how to make your own! This high-vibe essential oil is a must-have—especially the hydrosol! A complex aroma that blends citrus and floral undertones, it powerfully uplifts and relieves heavy sadness. It can help us break up with our most beloved food items thanks to its ability to reduce anxiety as mediated by the brain’s serotonin receptors. How-To: When intensely craving, spritz yourself with neroli hydrosol. Repeated use will allow your brain to associate the aroma and ritual with the recognition to nom on a healthier option. You’re frazzled. How do you deal? Yoga, meditation, exercise? If you want to try something new or deepen your self-care practice, use scent to bring you into a more balanced head space. While sometimes overlooked, essential oils boast therapeutic benefits—including greatly affecting the central nervous system. Recently, aromatic plant medicine has crept into consciousness as neuroscience research demonstrates a promising link between essential oils, the brain, and our ability to heal. The sense of smell is considered the first to develop in utero, and the olfactory cranial nerve is even labeled No. 1. Evolutionarily, it seems as though we’ve moved away from our old friend, olfaction. Philosopher Walter Ong wrote, “Sight reveals only surfaces” and perhaps it’s true. To get beyond our cultural flings with appearance, analysis, and detachment, smell can take us where vision and thinking cannot. Recently, fragrant molecules have piqued the interest of many medical professionals because they can easily pass through the blood-brain barrier, which is a big deal. While scent touches on different emotions for different people, the cellular level of the brain doesn’t discriminate. In fact, just smelling essential oils influences neurotransmitters. One study showed that lavender creates an affinity to bind to GABA, the brain’s relaxing neurotransmitter, which aligns with lavender’s well-known calming effect. Do you ever feel overcome with a tsunami of anxiety? If you have panic attacks or chronic, sudden onset anxiety, then add neroli to your shopping list. This oil is pricey, but it’s worth it. 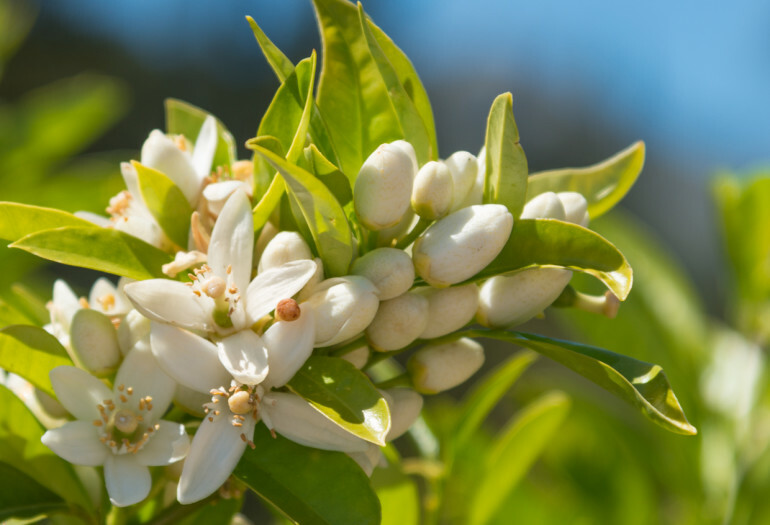 In fact, the results of one study show that smelling neroli is comparable to taking Xanax. While more research is needed, this preliminary research suggests that neroli modulates brain activity and reduces anxiety. This oil can be a healthy tool that nicely complements pharmacotherapy. How-To: Place a drop on your palm and inhale when anxious. A little goes a long way! Commonly referred to by its botanical name, Litsea cubea, this oil belongs to the laurel family. The cool, uplifting smell is reminiscent of citrus oils. Its abundant aldehyde chemical composition leads one to infer that it’s sedating yet uplifting. Seems like a paradox, right? What may chang so easily achieves is balancing the central nervous system while still maintaining alertness. It’s known to reduce stress and regulate central nervous system (CNS) activity. Just a whiff will have you feeling calm but present. How-To: Add 10 drops into an aromatic inhaler. Feel free to combine with lavender and marjoram for extra relaxation. Sometimes, we get so overwhelmed—zooming from place to place—that we forget what it feels like to stand strong in our core. If you’re in search of stability, get back in touch with ho wood. Distilled from the trunk of the tree, it powerfully centers and strengthens while calming the CNS. The soft, woody aroma has some of the highest linalool content of any essential oil, which is a chemical compound known to reduce anxiety and promote calmness. This oil is a must-have for those with stress-related insomnia. How-To: Add 2 drops to a bit of jojoba oil and rub on pulse points before sleep. Lavender gets a lot of the spotlight when it comes to relaxation and sleep, but ho wood is just as calming. Combine with neroli or vetiver for extra stress relief. This balsamic, fresh aroma acts on the neurotransmitter pathways while also working as an antidepressant. Part of the mind-body connection is focusing on the body, which is the peripheral nervous system (PNS). The major chemical component, 1,8 cineole, is incredibly potent and known to reduce pain. In fact, eucalyptus inhalation has been shown to decrease pain, swelling, and inflammation in patients who underwent total knee replacement. These results hint that eucalyptus plays a role in the serotonin system. How-To: Add 7 drops eucalyptus and 3 drops lavender to 1 ounce of sesame oil. Massage the area to relieve sore muscles and calm the mind. Any aroma lover knows what it’s like to obsess over a smell and carry it around at all times. Right now, that’s ylang-ylang for me. The exotic floral aroma is complex and instantly soothes my edges. But, there’s more than just my anecdotal evidence in support of ylang-ylang’s effect on the CNS. One study showed that the smell alone decreased blood pressure and heart rate but increased attentiveness. The same research team found that topically wearing the oil induced calm relaxation, which lends credence to its use in treating depression and stress. If you’re in need of a mind harmonizer, ylang-ylang is it. How-To: Add a few drops to some sunflower oil and apply as you would with perfume. This routine is a great way to start the day. For a grounding synergy, add some vetiver and sweet orange. This one’s for all the ladies! I don’t think it’s too far of a stretch to say that many of us could write the book on premenstrual syndrome (PMS) and menstrual cramping. After all, who hasn’t experienced period pain and cramping that makes you want to just lay down and relax? Frankly, we don’t talk about our sacred gift enough. Menstruation is a sign of fertility—the ability to bestow the gift of life. Understandably, we find it hard to honor that magic and spiritual perspective while wallowing in fetal position and canceling our social plans due to what can be excruciating discomfort. PMS rose to prominence in 1987 when Anna Reynolds of England was charged with the murder of her mother, which she committed while suffering from the effects of PMS. While Reynolds’ case is nuanced, her story highlights that PMS and menstruation were often taboo throughout history. In 1981, 20% of men believed menstrual pain was psychological, not physical, and 39% reported having the belief that a woman’s period affects her ability to think [http://www.worldcat.org/title/tampax-report-summary-of-survey-results-on-a-study-of-attitudes-towards-menstruation/oclc/10421512]. Despite what some may think, PMS affects brain chemistry and periods can be painful! In fact, biological research reveals that the fluctuation of endogenous opioids and serotonin during our cycle greatly contributes to mood stability and behavior [https://www.ncbi.nlm.nih.gov/pubmed/20191865]. It’s estimated that about 85% of women experience PMS symptoms each month [https://www.womenshealth.gov/a-z-topics/premenstrual-syndrome], and at least 20% of women say period pain hinders them from performing daily activities [http://www.aafp.org/afp/2012/0215/p386.html]. 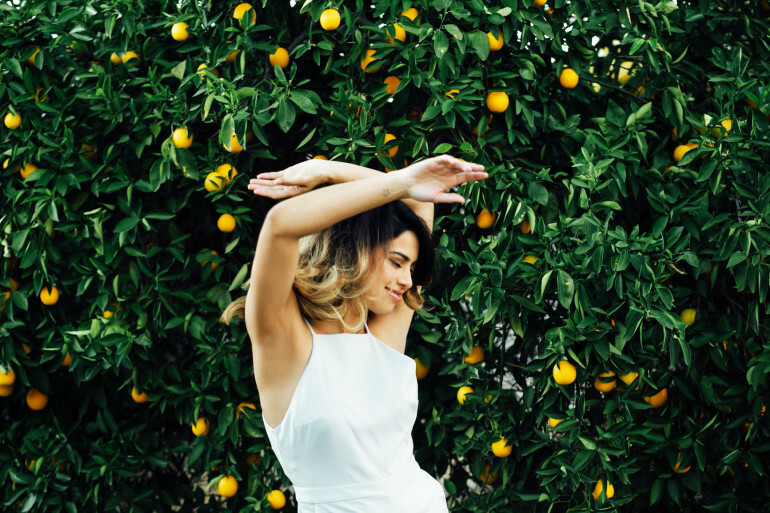 Though each person’s body and cycle is unique, we benefit from sharing experiences and natural remedies—especially when we feel as if our period and PMS keeps us from living and loving life. If you feel like you’ve tried it all, incorporate essential oils and ritual into your self-care routine for greater relief. Fatigue? Bloating? Dull aching? Insomnia? Irritability? Mood swings? Aromatherapy is a powerful subset of herbal medicine that can holistically help manage physical and psychological aspects that come with that time of the month. Below are 5 well-rounded essential oils that alleviate cramping and help balance hormones. When people complain of cramping or PMS, aromatherapists immediately think of clary sage. It’s nutty, earthy aroma works as an antidepressant and sedative. It’s the go-to oil for female hormone balancing and uterine relaxation. It helps manage symptoms of menstrual cycle irregularities, PMS, and menopause. In fact, clary sage has demonstrated anti-inflammatory and moderate peripheral analgesic activity [http://www.tandfonline.com/doi/abs/10.1080/10412905.1997.9699459], making it a go-to oil to apply topically for easing period cramps. How-To: Add 15 drops into a glass roll-on bottle. Top it off with an ounce of sunflower oil and massage on cramping abdomen. Feel free to add in other hormone balancing oils, like geranium, or analgesic oils, like plai. A mood uplifter that also calms, petitgrain can be over-shadowed by more well-known oils of the citrus family. But, petitgrain’s sweet, dry aroma nicely complements many heavier, earthy scents often used in period blends. It boasts anti-spasmodic and anti-inflammatory benefits, but works wonderfully on a more subtle, energetic level. Inhalation has been shown to balance the autonomic nervous system [https://www.ncbi.nlm.nih.gov/pubmed/27763785], so reach for this oil not only to help with cramps, but also manage irritable emotions and mood volatility. How-To: If you’re feeling low or lethargic, inhale some petitgrain. You might also want to try stimulating the ‘Grandfather Grandson’ acupressure point. Located about a thumb’s width below the ball of your foot on the middle part of the foot’s inner arch, stimulating this point mitigates cramping, while relieving stress and anxiety. A fresh and slightly rosy aroma, geranium embodies feminine energy. A known anti-inflammatory, it helps reduce symptoms of PMS and hot flashes. In fact, geranium inhalation has been clinically demonstrated to decrease anxiety and blood pressure [https://www.ncbi.nlm.nih.gov/pmc/articles/PMC4484988/]. While therapeutically powerful, I often blend using geranium as a balancing oil because it offers deep benefits beyond the physical body. It helps assuage mood swings and agitation. Reach for it when you need some calm, energetic loving. How-To: If you have hormonal headaches, add geranium to a topical cramp blend, but also try stimulating the “Union Valley” acupressure point. My mom taught me about this pressure point when I was younger, and it’s been my go-to for treating period headaches and cramps. Stimulate this point by gently pressing the skin between the thumb and index finger on either hand. One of the only trademarked oils, fragonia is truly special. A balanced oil, it’s delicate, yet mighty. While there’s not much literature, it’s known for balancing homeostasis and regulating the body’s hormonal clock. Preliminary research confirms what many who work with fragonia know— it’s anti-inflammatory [http://europepmc.org/abstract/med/19090831] and has an analgesic effect, which helps with period discomfort. How-To: Traveling and PMSing? If you feel like your body rhythm is thrown off, add 7 drops of fragonia into an ounce of sesame oil and place it on the base of your neck and temples to re-energize and re-center yourself. Medicinally used since ancient times, I reach for it when I am overwhelmingly crampy and need instant relief. The strong apple-like aroma is soothing and familiar. It’s a must-have oil to treat muscle spasms and cramping, and works wonders for dysmenorrhea and sore breasts. A robust analgesic and anti-inflammatory [https://www.ncbi.nlm.nih.gov/pubmed/?term=rossi+anthemis+nobilis], it also blends well with many other oils on this list. How-To: Take a few drops and rub neat on your lower abdomen when having intense cramping. Because it’s an acute condition, it’s safe to use without dilution— only every once and a while! Concurring with Mark Twain, “the finest clothing made is a person’s own skin”. But for many who suffer from conspicuous and irritating skin conditions, like eczema, this sentiment can be hard to embody. Eczema refers to many chronic, inflammatory skin conditions that affect about 334 million people globally. Generally characterized by dry, itchy, and red skin patches that lead to crusting, eczema’s root cause remains elusive. Some medical experts believe there is a strong allergen component related to eczema, be it food or environmental. Beyond environmental factors, it’s also believed to be partly genetic. Others suggest that eczema is the result of an autoimmune reaction triggered by things like stress, poor nutrition, and underlying bacterial infections. In conjunction with becoming mindful about how nutrition affects the skin, aromatherapy and plant medicine can help treat eczema and reduce topical inflammation. A word on safety—I advise patch testing any essential oil before using topically. Don’t let your skin condition continue to isolate you from enjoying life to the fullest. If you’ve been in and out of the doctor’s offices and still find yourself dissatisfied, try your hand at these five easy remedies to tackle even the most stubborn eczema. If your eczema is really dry, dehydrating it with a scrub is not the best treatment option. Instead, cool it off with an effective aloe vera gel immediately after cleansing. Gels are the most effective way to dermally absorb what we put on the skin and they’re super easy to make. German chamomile hits the trifecta—relieving itching, healing the skin, and calming the nervous system. It’s also been shown to enhance skin hydration in an aqueous gel (Monges et al., 1994). Lavender is an all-around healer that harmonizes this blend and pairs nicely with the sweet aroma of balsam Peru, which is included for its immune-supporting and anti-inflammatory properties. If you have unshakable eczema on already dry skin areas, like elbows and knees, then this body oil is for you. It can be used immediately after showering on damp or wet skin. Tamanu oil is a go-to for healing very dehydrated skin, plus it boasts this unique light-green hue. If your eczema is related to an autoimmune reaction, make this oil your base because of its anti-inflammatory and analgesic properties. Tamanu’s moisturizing actions can be enhanced by deeply healing essential oils, like helichrysum, Melissa, and Roman chamomile. Got itchy eczema that drives you up the wall? Some have such a strong urge to itch that they’re unable to sleep. To quell itching, use an occlusive salve that hydrates and heals overnight. A favorite remedy of mine—just ask my mom how well it works! Manuka essential oil is rarely in the spotlight, but it’s the center of this blend due to its protective and preventive effects. Plus, its slightly spicy aroma helps balance the nervous system before bed. If you want a vegan product, use candelilla in place of beeswax. This recipe makes ~4 oz. of salve, and feel free to experiment with the wax and herbal oil ratio. If you’ve never used hydrosols and you have eczema, they’re about to become your best friends. Gentle and safe, they keep skin hydrated, which decreases painful cracking and the likelihood of infection. I suggest experimenting with hydrosols. Reach for Roman and German chamomile hydrosols to calm inflammation, Manuka hydrosol to treat tender skin and fungus-related eczemas, helichrysum hydrosol to supplement or use in place of the rather pricey essential oil, and calendula hydrosol for any dermatitis. This week brought the first full moon of spring in the Northern Hemisphere. And what better way to welcome spring, awaken the mind to new creativity, and tap into higher consciousness than by using the power of scent? Below are six high-vibration essential oils, flower essences, and absolutes hand-selected for tapping into the magic of the season. The pink full moon has Venus conjuncting with asteroid Chiron. Greek mythology tells the myth of Chiron, a centaur whose wounds allowed him to become a compassionate teacher of healing. Psychiatrist and psychoanalyst Carl Jung used mythical Chiron as the archetype for “wounded healer.” Jung’s concept of the wounded healer refers to each person’s ability and need to consciously face wounds in order to transform them and ultimately receive their blessings. You can’t heal what you can’t feel. The pink full moon brings amplified sensitivity and perhaps the opportunity to acknowledge past trauma and hurt. Ho-to: Give yourself permission to feel and be unconditionally loved. To do so, reach for rose as it energetically promotes the marriage of feeling and understanding. 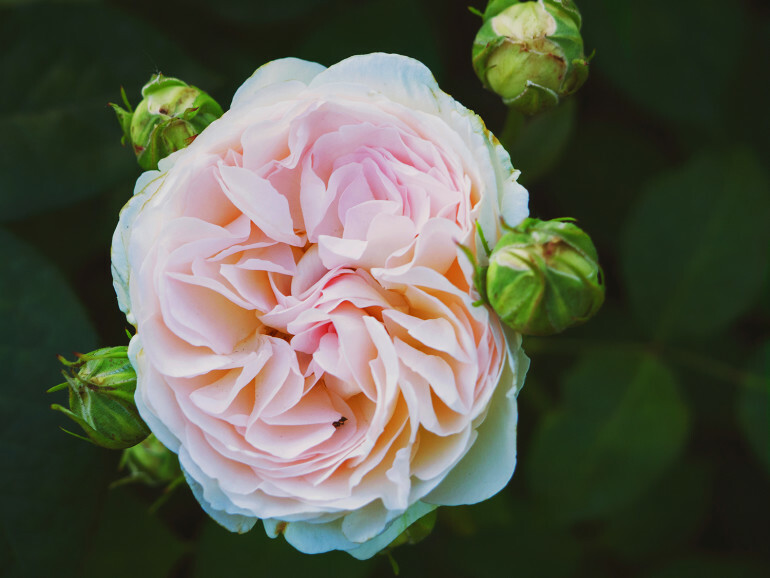 Since rose essential oil is very precious, using just a drop or two in a meditation blend can be a ritual to get in touch with your wounded healer. Springtime isn’t only for flowers. Grasses grow too! Lemongrass essential oil pays homage to the pink full moon’s alternate name, sprouting grass moon. This moon will likely prompt increased tension—people may get on your nerves and drive you mad as a result of the cardinal T-square tug-of-war. If you start to boil up in agitation, it may be best to give yourself some space. 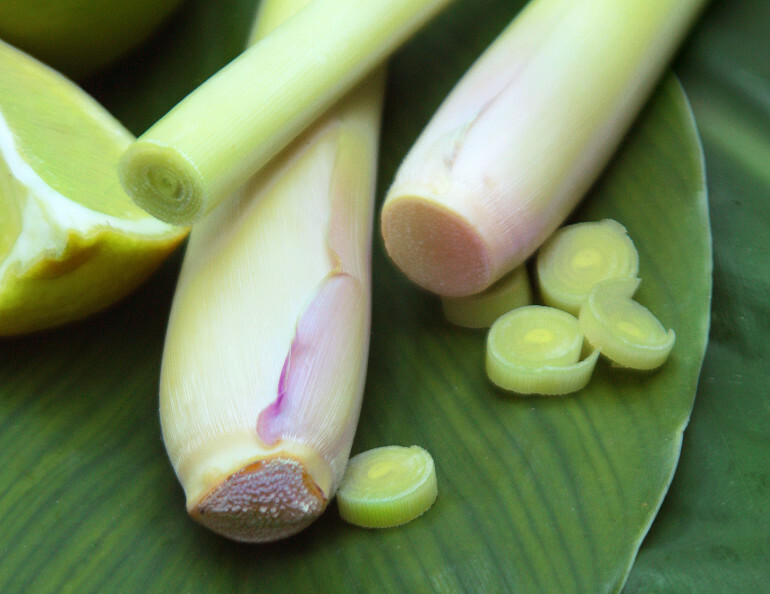 Lemongrass is a potent and natural insect repellent, which is great for this time of year when the bugs come out to play. But it also creates a protective boundary that not only wards off creepy-crawlies but also rebuffs toxic and negative energy. How-to: Sometimes it’s necessary self-care to create safe boundaries. Make a lemongrass auric room spray that doubles as a bug repellent. Add 7 drops lemongrass to an ounce of water in a spritz bottle. Shake to mix well before using. Feel free to add a few drops of patchouli or tea tree to better keep the bugs at bay and give you more than a single aromatic note. 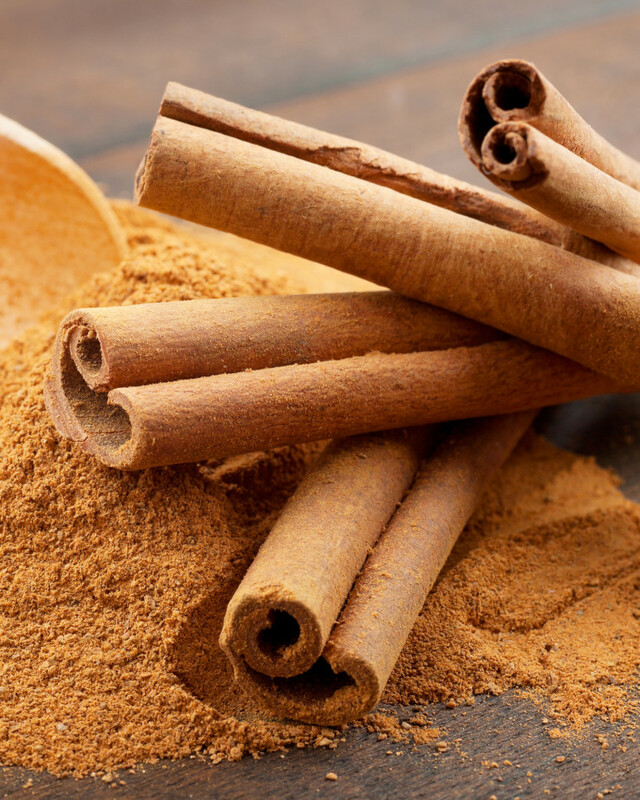 Cinnamon bark is an incredibly powerful oil that’s not often topically used since its largest chemical constituent, cinnamaldehyde, can be a mucus membrane and dermal irritant. Cinnamon is one of the strongest antibacterial essential oils, so you might want to include it in some DIY spring cleaning products. But on a subtler energetic level, cinnamon inspires moving on. How-to: As this full moon occurs in equitable Libra, just inhaling cinnamon from the bottle might be the inspiration you need to renew and restart harmoniously—in true Libra fashion. One whiff of it and you might feel encouraged to see another’s point of view and be able to picture a situation from a new perspective. While this is not an essential oil, flower essences can also help set intentions and ritualize the moon cycle. 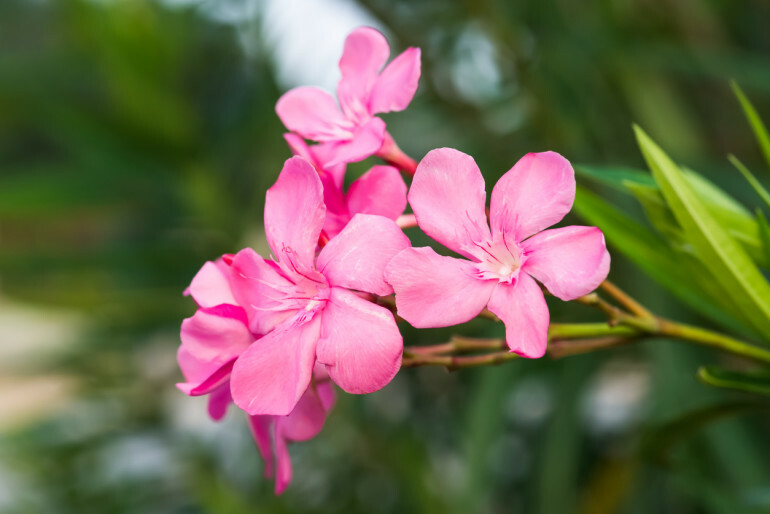 Also known as the desert rose, oleander is one of the most common garden plants that’s poisonous if ingested, but it’s perfectly safe as a flower essence. This full moon intersects with many holidays and celebrations—Passover, Easter, and Hanuman Jayanti, to name a few. These holidays remind us to unplug and foster connections with ourselves, others, and our spirituality. Some even believe oleander represents the feminine face of a higher power. This flower essence can help us see the fine line between observing and judging. Oleander reminds us that we are spiritual beings having a human experience. How-to: Take a deep dive with faith and strive to align with higher consciousness. Let go and embrace an easygoing attitude by adding one drop in a bottle of waterthat you drink throughout the day. Keeping to the theme of pink-inspired oils, grapefruit is a personal favorite of mine. But, it’s not only on this list because of its hue. Spring is a time when the earth reawakens and we uplift ourselves from the cold of winter. To energetically support this seasonal shift, citrus oils are must-haves to do the trick. The cheerful, sweet aroma acts as an antidepressant and is also great to stimulate psychic energy and lymph blockages. How-to: Slough off winter with a grapefruit body scrub in honor of the pink full moon. Add 6 drops of ruby grapefruit essential oil and a dollop of jojoba into an ounce of dead sea salt and use when showering. Like oleander flower essence, this is not an essential oil. This absolute promotes clarity and cultivates inward thinking, which is much needed when we ponder what the planets are up to. This full moon is joined by Mercury turning retrograde, which began on Sunday April 9. Mercury in retrograde has garnered much attention as of late, but take a deep breath—here’s mbg’s guide to help you navigate it. Retrograde occurs as the planet illusorily moves backward, which may cause communication and judgment issues. Take your time doing things and commit to finishing what you start. How-to: Retrograde periods (and many full moons) offer the opportunity to stop and contemplate. Slow it way down! 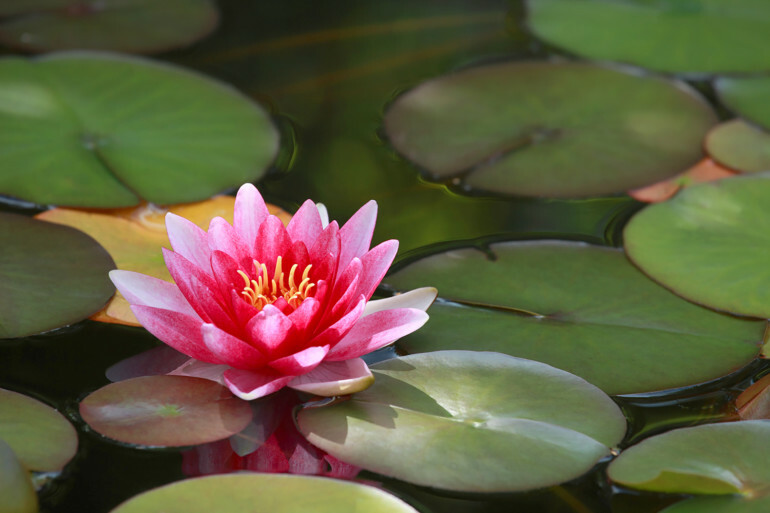 Just as the beautiful lotus flower rises from and continues to grow in muddy, miserable conditions, so can we. This absolute is very valuable, so just a drop is enough to reap the energetic benefits. Set the perfect tone for deep yin yoga by anointing your third eye and crown of head to celebrate the full pink moon with pink lotus! Do you ever feel “off”—as if your brain isn’t optimally functioning? Brain fog is a buzzy term that has many talking. Though it seems to be increasingly common, brain fog is not normal. Numerous medical experts debate the root cause but often agree that it’s a side effect of lifestyle choices. Food allergies, nutritional deficiencies, stress, inflammation, and lack of sleep and exercise can contribute to depleted energy and declining mental acuity. In fact, recent neuroscience research shows that many suffering from brain fog report having chronic fatigue, gluten intolerance, fibromyalgia, or neuropsychiatric disorders. While brain fog triggers vary greatly among people, certain aromas can energetically inspire shifts in attention and dissolve the mind’s murky haze. In fact, research slants toward essential oils having the power to increase alertness and sharpen mental faculties. Lavender inhalation has been shown to improve mathematical computation speed, and it also improves work performance when inhaled during breaks. Distracted? Mentally fatigued? Forgetful? Try these 6 essential oils to combat brain fog, stimulate your mind, and increase energy. Known for being a gentler alternative to tea tree, the warming, camphor-like aroma can crack the mental whip. With an affinity for the respiratory system, it also decongests the mind. In Western herbalism, it’s renowned for quickening the pulse and increasing alertness. How-To: Put some pep in your step with a breathing blend. Add 5 drops cajeput, 2 drops green myrtle, and 3 drops lavender onto a cotton wick and secure in an aromatic inhaler. A very potent oil, peppermint has a menthol, clean aroma that has a cooling effect. A popular oil for stimulating the mind, it’s useful when one cannot focus. Sometimes brain fog is accompanied by unbearable migraines and nausea, but peppermint alleviates tension headaches. If you’re an essential oil aficionado looking for something new, substitute cornmint for peppermint as they’re similar in therapeutic benefits. How-To: Add 4 drops peppermint to a cotton ball or into a diffuser, then try doing gentle breathing exercises to relieve head tension. One can’t discuss banishing brain fog without mentioning rosemary. This is a go-to oil to support memory and mental exhaustion, and the vibrant and oxide-rich smell can snap you into the present moment. It has a penchant for clearing the mind and alleviating mental fatigue. Inhalation has been shown to improve speed and accuracy on cognitive tasks, making rosemary the ultimate brain-boosting oil. How-To: Make a roll-on blend for work by adding 6 drops rosemary, 3 drops sweet basil, and 2 drops peppermint into an ounce of sunflower oil. Spanish sage can sometimes fly under the radar thanks to its membership in the large Salvia family. Also known as lavender sage, this fresh and herbaceous oil packs a punch. Stimulating and cooling, Spanish sage helps foster insight and improves memory. In fact, it’s clinically demonstrated to improve memory and attention in Alzheimer’s patients. How-To: When feeling foggy in the noggin and in need of remembering, smell some Spanish sage— gently wafting from the bottle will do the trick. An incredibly expansive and energizing oil, sweet basil can get you to concentrate. Inhaling the fresh, almost spicy aroma provides a great pick-me-up that will even clear your sinuses. Not only an effective mood changer, sweet basil can also expel sluggishness as it’s known to reduce inflammation. How-To: When looking for mental clarity, add 5 drops to an ounce of jojoba oil and anoint on your pulse points. Sometimes referred to as tangerine or red mandarin, this oil promotes bliss and optimism. Considered safe for all ages (even kids! ), the sweet citrus scent is calming yet uplifting. It works wonderfully as an antidepressant and soothes the central and sympathetic nervous systems. It helps manage stress and hyperactivity, providing sharp focus. How-to: Add 10 drops to an aromatic inhaler and use when feeling mentally drained and in need of encouragement. What essential oils do you use for beating brain fog and increasing energy levels? Dandruff is normal. Shedding the scalp’s skin cells is healthy, but chronic flaking, itchiness, and dryness can persist despite every effort. While some are embarrassed by dandruff, it’s really common—approximately half of the world’s population is pestered by it. While the condition affects many, the root causes are ambiguous. Some doctors posit that it’s fungal or hormonal. Others believe it to be an inflammatory response, like psoriasis. Some think it’s exacerbated by food intolerances. But many experts agree that for a seemingly simple condition, it’s multifactorial. Skin conditions are complex. Often, they are more than a direct result from external influence. The skin acts like a lightning rod— grounding the body’s dis-ease and manifesting it on the surface. Dandruff can arise from internal disharmony. Perhaps unsurprisingly, common skin disorders have been found to cause low self-esteem, social isolation, anxiety, depression, and decreased confidence. Sound familiar? Stress can aggravate dandruff. With no known cure, dandruff requires a holistic four-step treatment approach. First, identify the root cause. Ask yourself whether the dandruff is acute or chronic. Is it environmental? Related to stress? Second, remember you are treating the sensitive scalp, which is the seat of consciousness. Use extra TLC and blend only 1 to 2 percent essential oil dilutions. Third, consider emotions and how they give us physical signs. Use essential oils and their aromas to do more than treat the physical condition. And last, ask yourself what’s no longer serving you in your hair care routine and experiment with different treatments. One of my favorite essential oils, the smell is softer than traditional rosemary, which is the cineole-rich chemotype. Because it’s gentle, rosemary verbenone is the go-to oil for skin and hair care. Rosemary verbenone is known for its cellular regenerative abilities and is recommended for treating an itchy scalp and dandruff. Emotionally, it clears the mind and restores psychological balance. Chemically, verbenone is a mild ketone and should be avoided with children and during pregnancy. How-to: Add rosemary verbenone to your shampoo at a 2 percent dilution. Continue normal use for a month. For even better results, swap out your shampoo for one that does not contain popular drying ingredients sodium lauryl sulfate (SLS) and sodium laureth sulfate (SLES). Atlas cedarwood may be a familiar scent as the wood is popular for furniture and trinkets. Traditionally, it was used as temple incense. Its sweet, balsamic aroma helps diffuse melancholy and feelings of emptiness. The warm scent also builds confidence, which makes it a must-include oil when emotionally blending for dandruff. It’s a powerful antifungal and astringent that works wonders for oily skin, seborrhea of the scalp, moist eczema, hair loss, and dandruff. How-to: Add 5 drops to 1 oz. of argan oil. Massage thoroughly on the scalp when having excess dandruff. Let the oil soak for at least 30 minutes before rinsing out. Not to be confused with the aforementioned atlas cedarwood of the pinacae family, Virginian cedar is actually a member of the juniper genus. The fresh, “pencil-like” scent has made it popular in perfumery and soapmaking. Astringent and antiseptic, Virginia cedarwood is ideal for those with a very dry scalp since its sedating properties subdue inflammation from scratching. Also reach for this mellow oil to relieve nervous tension and stress. How-to: Add a few drops (no more than 1 to 2 percent dilution) into a light conditioner. Use daily or as needed. Who wouldn’t want to include this highly aromatic sweet and floral essential oil in a blend? A native grass of Southeast Asia, palmarosa is valued for its roselike scent and high geraniol content. Among the most effective antibacterial and antifungal oils, it also has a healing affinity for the skin. Plus, it blends well with rosemary verbenone and lavender. How-to: Energetically cooling, palmarosa is a great addition to a moisturizing hair mist. Add 8 drops to a 1-ounce spray bottle of lavender or tea tree hydrosol. Shake well and use after washing. 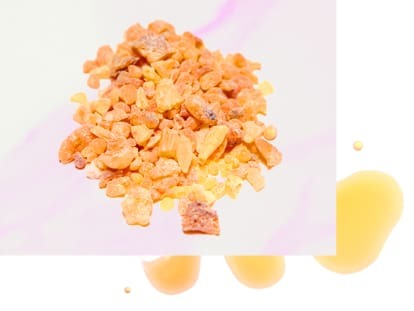 Another powerhouse that’s gentle enough for sensitive skin, frankincense is a spiritual oil with a clean and fresh aroma that makes hair smell divine. Rich in esters, it can help heal the root cause of dandruff. Frankincense is useful for inflamed scalp conditions and can soothe dry, mature eczema. Historically, it’s been used to support reflection and healing of the spirit and mind. How-to: Make a meditative head massage oil by adding 5 drops to 1 ounce of avocado or sesame oil. Feel free to add other essential oils high in esters, like geranium and palmarosa. Make it a weekly self-care ritual! While many dandruff blends call for tea tree, it can be too drying. In my opinion, patchouli is often a better alternative for scalp conditions. The earthy, musty aroma not only grounds and centers but also blends well with other essential oils, like frankincense. It’s a triple-threat acting as a potent antidepressant, antifungal, and anti-inflammatory. How-to: If your dandruff is very inflamed or the result of fungus, add 4 drops to calendula oil with 2 drops helichrysum and massage into the scalp after washing and before sleep. Let it steep overnight and wash out in the morning. 1. It takes a lot of plant to distill essential oil. To get essential oils, flowering plant parts or peels must go through a distillation process. Naturally, some plants yield lots of oil easily, and others have more labor-intensive processes, yielding lower amounts of essential oil. For example, damascene rose is one of the most notorious labor-intensive essential oils to distill, which is reflected in its high price tag. It takes approximately 2,500 pounds of rose flowers to produce 1 pound of essential oil. Rose is a delicate flower and distillers have a short 30-day window to harvest the crop, which cannot be done during peak hours of the sun’s heat. That being said, pure rose damascene oil often sells for more than $2,000 per pound. Rose is perhaps the most extreme example, but other essential oils, like many citruses, are distilled via cold-pressed expression and can be found in usable quantities for $15 or less. Knowing about specific plants can help you identify fair market prices and spot red flags. 2. Educate yourself on the origin of oils. Naturally, different plants mean different prices. Some plants are considered rarities (as you saw above with rose), and it’s important to consider ecological and manufacturing factors that influence oil price. Climate? Extinction? Trade laws? Often, a high price from a reputable seller should signify a high-quality oil. A beloved essential oil of mine is rosewood; however, rosewood is cultivated from a tree native to the Amazon rain forest that’s considered endangered. Knowing where your oils come from and how they’re harvested makes for a more mindful consumer. In addition, many essential oils share therapeutic benefits and similar aromas making substitution easy. For instance, though rosewood is becoming more sustainably harvested, I use lavender or ho wood instead. Essential oils are highly concentrated plant extracts. A little goes a long way! That being said, don’t be fooled. A small 5- or 10-ml bottle is very potent and will likely be enough to last you many months with frequent use. But, the shelf life of oils varies drastically. The general rule of thumb is to use essential oils within a year of purchase, but many will keep fresh for longer if refrigerated. In fact, many aromatherapists refrigerate precious oils and always keep citruses and more volatile, fleeting top-notes and carrier oils in the fridge. Additionally, essential oil dilution is key for effective therapeutic benefit. In fact, nearly all essential oils, with the exception of lavender and tea tree, must be mixed with a carrier oil before using it on skin. Using a few drops of an oil straight from the bottle can cause skin sensitization, which may be in the form of an allergic reaction or rash. Properly diluting oils will make them last longer. It’s understandable for those new to aromatherapy to want every essential oil. But it takes time to build your own apothecary and connect with different scents. If you are looking to get started, I suggest buying three common, well-priced, and effective essential oils with few safety concerns: lavender, tea tree, and sweet orange. Buy a diffuser and use it. Diffusing is an incredibly economical use of oils that allows you to use them every day while not being overwhelmed with learning curves for safety with topical application and DIY product formulation. Additionally, aromatherapy has many uses—health, skin care, cleaning, etc. So, it’s important to align the quality of oils with your needs. For instance, I use well-researched, high-quality oils on my face but am less rigid when choosing oils to include in DIY house-cleaning products. And if you’re into aromatherapy for skin care, start with hydrosols. Hydrosols are the water-based by-product of the distillation process, but they are much gentler and cheaper than essential oils. Plant Therapy has teamed up with industry leader and aromatherapy safety guru, Robert Tisserand. With his collaboration, they derived an entire line of kid-safe synergies that are suitable for your entire family. They have transparent third-party testing practices and some of the best customer service in the business—for example, on their website, if you need to contact them, you can choose to speak with customer service or a certified aromatherapist. With a large selection of oils, they sell in many different sizes and have economical 10-ml bottles perfect for those looking to test. Nationally recognized thanks to its presence in retailers like Whole Foods and Amazon.com, Aura Cacia is a member of Frontier Co-op. Aura Cacia is my go-to for more expensive, pre-diluted oils, like helichrysum. They have affordable, good-quality options that you can get in a jiffy. Additionally, as a part of the co-op’s sustainable sourcing model, they give back via the Positive Change Project with each purchase. Industry expert Dr. Kurt Schnaubelt offers nothing but genuine and authentic essential oils at Original Swiss Aromatics. Their safeguard against adulteration is close relationships with each producer that often wild harvest and organically certify their products. Be sure to shop their collection if you’re in search of rare oils or always want information on the oil’s production and collection. If you are looking to shop local, go for it. There are many small-business owners who run amazing apothecaries that craft unique blends or products at a fair price. Some of my favorite include Stillpoint Aromatics in Sedona, Arizona; Enfleurage and New York Institute of Aromatherapy—both in NYC; and Eden Botanicals located in Petaluma, California. If you do some research, you may find reputable aromatherapy schools or shops in your area and find that you like some suppliers more than others for certain oils. There seems to be lots of chatter about lymph nodes and lymph detox and draining. And for good reason as the lymphatic system is a key player in regulating the body’s immune system! Comprised of a large network of tissues and organs responsible for ridding toxins, its primary job is to transport lymph, which is an infection-fighting fluid that circulates throughout the body. Lymphatic vessels connect to lymph nodes, which are where lymph is filtered. With approximately 600 lymph nodes in the human body, located in tonsils, groin, spleen, and armpits, it can be difficult to know when things go awry. While many oils in the citrus family have an affinity for detoxifying and decongesting lymph, grapefruit is especially cleansing. Included in many cellulite creams and body scrubs, grapefruit’s uplifting and citrusy aroma seems to inspire movement in the body as it does in the mind. Grapefruit is a proven antibacterialand has been shown to clinically reduce lymphedema when coupled with gentle massage and lymph-stimulating exercises. How-To: Dry brushing is an effective way to stimulate lymph movement, and to continue reaping the benefits, make your own post-dry brush body oil. Add 15 drops of ruby grapefruit into 1 oz. of a skin-friendly carrier oil, like rosehip seed, and lather thoroughly. Similar to grapefruit, lemon is a must-have when looking to stimulate lymph movement. Lemon’s chemical composition is primarily monoterpenes, meaning it’s a powerful antimicrobial and antibacterial. In Traditional Chinese Medicine, lemon oil is sometimes used to stimulate acupuncture points. Some practitioners use lemon on ST 26 and KD 7 to stimulate “Wei Qi,” which is the defensive immune system. How-To: For an at-home remedy, make lemon body scrub. Add 10 drops of lemonwith a tablespoon of jojoba oil into an ounce of Himalayan salt. Use all over in the shower giving particular attention to swollen areas. In my opinion, guaiacwood is one of the most underrated essential oils because it’s very economical and a go-to for treating gout, edema, and fluid retention. It’s also a robust anti-inflammatory thanks to its high guaiazulene chemical composition. The smoky, deep aroma has historically made it popular with perfumers. Do be aware that it’s a viscous oil and will need to be heated to ~110°F to use. On the bright side, it has an incredibly long shelf-life, which can be up to eight years! How-To: Give yourself a lymphatic massage by combining guaiacwood with its therapeutic and aromatic complement, cistus, into a carrier oil, like sesame or sunflower. Popular in ancient Rome, bay laurel was a symbol of wisdom and peace. It has a fruity and camphorous scent that is known for moving stuck energy as well as supporting lymphatic drainage and immunity. It’s a known antioxidant and antibacterial that’s historically been used to treat infections. Industry leader, Dr. Kurt Schnaubelt, says one gentle use of it on swollen lymph nodes will produce nearly immediate relief. Though it is generally considered safe, do not use while pregnant. How-To: Add 4 drops of bay laurel into an ounce of sweet almond or jojoba oil and rub on swollen lymph nodes. Like guaiacwood, mastic is incredibly underestimated. Traditionally used as a lymphatic and circulatory decongestant, mastic is renowned for reducing edema and treating spider and varicose veins. Due to high monoterpene chemical composition, it’s known for being an impressive analgesic and anti-inflammatory. Interestingly, mastic has been clinically shown to inhibit cancer cell growth. Do note that these findings are preliminary and in need of replication—much more research needs to be done. Mastic also has an affinity for the respiratory system possessing antimicrobial properties that tackle any respiratory issue. How-To: Reach for mastic when bogged down with a cold or flu that affects your lymph nodes. Add 6 drops to an ounce of aloe vera gel and rub on affected areas. Feel free to blend mastic with other immune or respiratory supporting oils, like cedarwood. Perhaps a bit of a misnomer as it’s distilled from the berries and needles, it is easily confused with other juniper species. A detoxifier that stimulates movement, it is similar to many other oils on this list as it relieves edema and stagnation. Juniper is a natural antibacterial and antimicrobial that tirelessly fights infections. An immune booster, juniper is a great addition to DIY cleaning products. How-To: Add 3 drops juniper (optional to add 2 drops black pepper and 2 drops geranium) into an ounce of sweet almond or avocado oil and rub on areas that need energy. For an added bonus after using the oil, I hang from my inversion table to further stimulate lymph movement and circulation. Do you sometimes feel like you’re not living in the present moment? Recently, there’s heightened interested in learning how to better leverage the focusing power of the brain to work and engage more efficiently. Fortunately, holistic aromatherapy can support your intention to be more mindful and motivated. Odors have long been known to alter mood and attention, but it seems as though we’ve lost touch with our aromatic wisdom. In fact, many would rather lose their sense of smell than give up their cell phones or computers. While most of us are not acutely aware of smell in daily functioning, approximately 5% of our DNA is devoted to olfaction, which serves as a testament to its significance on influencing behavior. Clinical studies have found essential oils to be suitable (and non-pharmacological!) enhancers of human cognitive performance. Peppermint aroma increases alertness, smelling citrus boosts mood and energy, and inhaling rosemary has been shown to sharply focus the mind and increase memory. Take control and give your brain a natural boost with these 5 easy DIY aromatherapy recipes you can use at the office, at home, or on-the-go. The mind wanders, which is natural and can be healthy. So when you really need to focus, reach for this custom essential oil blend that will instantly command your deepest attention upon inhalation. The strong, balsamic scent has a cooling emotional effect. It clears the mind and aids concentration. In Ayurveda, it supports the clearing of kapha excess conditions, like lethargy. 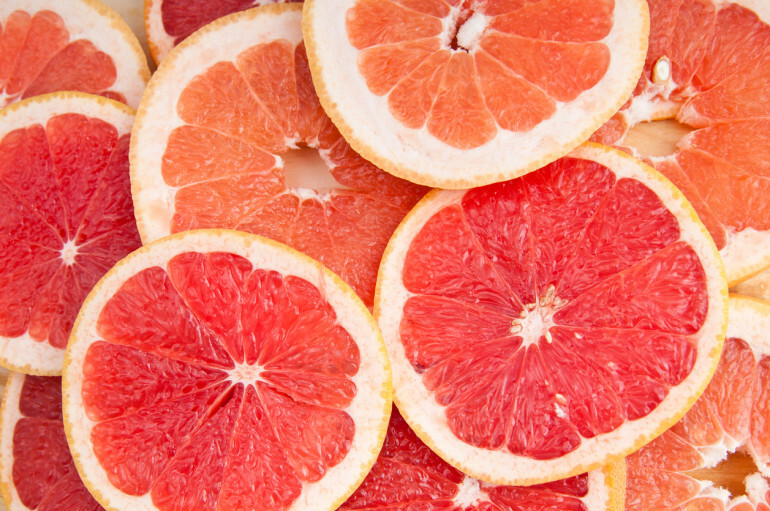 One waft of fresh grapefruit will have you feeling re-energized. 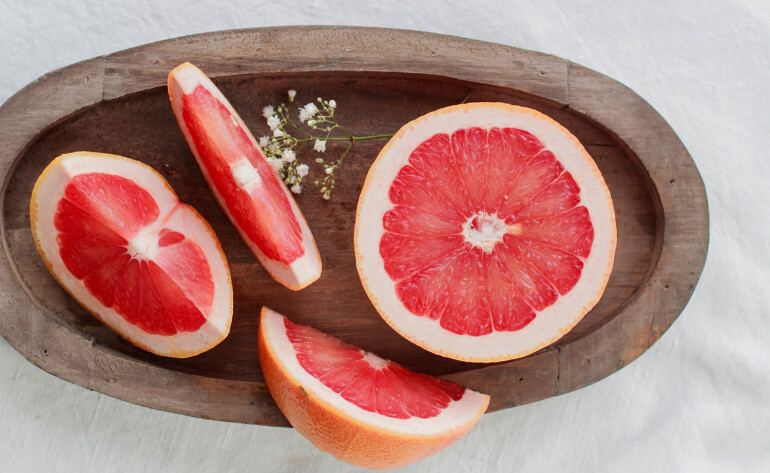 Grapefruit shifts blocked energy and relieves nervous exhaustion and anxiety associated with performance stress. It smooths away stagnant Qi-energy and lightens the burden of mental congestion. How-to: Place 3 drops blue gum eucalyptus, 5 drops rosemary, and 7 drops grapefruit on a cotton wick and insert into inhaler. Use whenever to boost concentration. Feeling stuck? If you are in search of a natural productivity aid, look no further. Re-center yourself with this essential oil roller-ball blend that’s sure to have you making decisions from a clear mind. Its menthol-like and cooling odor is not only known for relieving painful headaches, but also inspiring enthusiasm. Peppermint aids concentration and catalyzes action. Its most useful for those feeling apathetic or lacking confidence. Sweet fennel (Foeniculum vulgare): A member of the Apiaceae family, fennel represents potential and new beginnings. Its licorice-like scent motivates and busts through mental blocks. It helps the mind adjust and overcome boredom. Cardamom (Elettaria cardamomum): Spicy and balsamic, it stimulates movement. It ameliorates poor concentration and is useful when lacking vital energy. Cardamom soothes the over-thinking worrier and can restore appetite for life. How-to: Add 3 drops peppermint, 2 drops fennel, and 4 drops cardamom into a 10 ml glass roller bottle. Then, fill to the top with sunflower oil. Apply to pulse points. Do you find yourself zoning out when others are talking? If you want to be a more mindful listener and pay deeper attention, try these essential oils in your own temple massage oil that will open your ears and heart. A sacred scent of earthy and woody tones, it stills the mind and promotes tranquility. 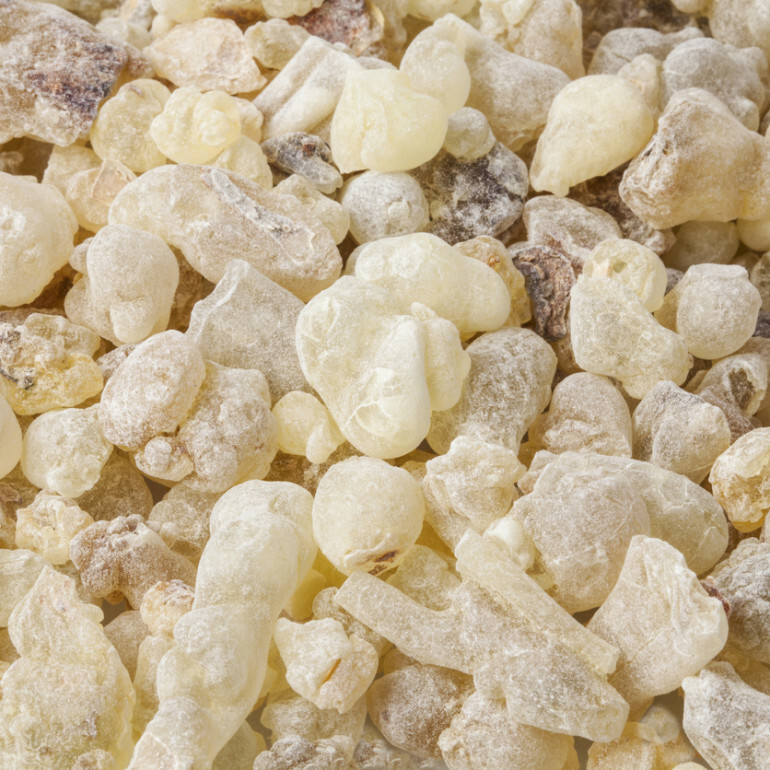 Frankincense grants the ability to tap into higher consciousness and can elevate one to a more meditative place. Distilled from the root, vetiver grounds energy and promotes strength. It’s helpful for quieting swirling thoughts and calming when there is oversensitivity and openness. It’s the go-to oil for those who tend to float outside of their bodies and minds, but desire to be more present. The sensual aroma calms the heart and eases the mind. Distilled from a majestic flower, it embodies feminine energy and significantly improves attentiveness. How-to: Add 2 drops vetiver, 5 drops frankincense, and 6 drops ylang ylang into a 1 oz dropper bottle. Fill the rest of the bottle with a carrier oil, like sweet almond. Drop a smidge on your hands, rub them together, then massage thoroughly on temples and ear lobes. If you’re tired and groggy, indulge in extra self-care. Make your own uplifting and calming body scrub that’s perfect for kick-starting productivity. Embodying sunshine in a bottle, the citrus scent cultivates a sense of well-being—it uplifts while calming (thanks to a small percentage of the monoterpene alcohol, linalol). Mandarin speaks to our inner child and assists with clearing out stale ideas. A cross between 2 lavenders, it releases pent-up energy and eases frustration. Lavandin oil contains between 7-12% camphor, making it more powerfully uplifting and stimulating than popular cousin, lavender. 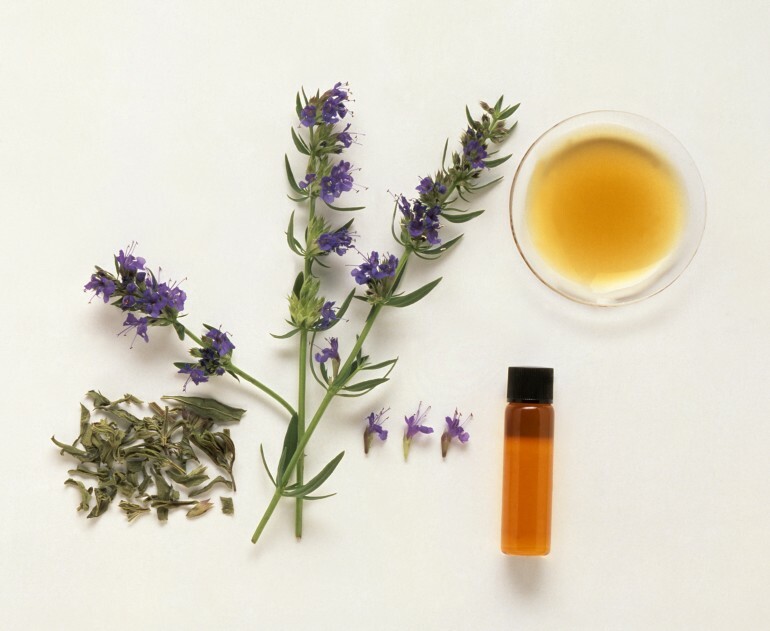 How-to: Add 15 drops of mandarin and 10 drops of lavandin into a 2 oz jar. Add 1.5 tablespoons of sea salt and brown sugar with a dollop of moisturizing jojoba oil. Mix well and scrub all over when showering. Stressed and in a time crunch? Slow down. In order to work efficiently, it’s important to observe your feelings. Take a quick pause with your own hyper-focusing facial mist. Its gentle, forest-like scent brings on a wave of warming energy. Black Spruce clears emotional blockages and expands your chest— creating breathing space. It is powerfully relaxing in moments of deep panic or feeling rushed. Giving stamina when fatigued, it also equilibrates the endocrine system. A powerhouse consciousness shifter and proven antidepressant and anxiolytic. Useful when unable to focus, lemon stabilizes during emotional outbursts. Running on fumes, it revitalizes energy. The delicate, sweet scent balances the spirit. It adds a unique harmonizing twist to blends and is incredibly hydrating, making it great for skincare. One sniff can pull you out of your head and into your heart. How-to: Add 3 drops black spruce and 6 drops lemon into 2 oz spray bottle. Fill to the top with white rose hydrosol. Shake well before each, then mist lightly on face and décolletage. The shelf life is 3-6 months. While some may think that aromatherapy is just smelling oils, that’s certainly not the case. Topical application of essential oils offers numerous therapeutic benefits that complement healing achieved via inhalation. Essential oils contain compounds from diverse chemical families, which give them unique analgesic, anti-inflammatory, anti-spasmodic, and mucolytic properties. Though frequently housed in small 10-mL bottles, don’t be fooled—essential oils are immensely powerful. In fact, many oils are 50 to 100 times more concentrated than their parent plant. Safety is key, and each individual connects and reacts to oils and synergies differently. Some oils, like cold-pressed citruses, are photo-toxic and others can cause sensitization. Skin sensitization may occur if oils are improperly diluted or used too frequently in high doses. My rule of thumb: Only use tea tree and lavender neat on mature, adult skin. Most other essential oils require dilution in carrier oils. There exists much misinformation on essential oils leaving one wondering how and where to use them. So, let’s explore best practices for bodily application—from head to toe! Use your shoulder to hold your cellphone while making calls? Or, do you ever experience intense pain inside your head that’s hard to localize or describe? Four muscles deep on the back of the skull, the suboccipital muscles, are responsible for turning and tilting our heads. Stimulating these muscles may help release emotional tension and ease headache, migraine, and TMJ pain. How-to: Essential oils are safe to use on your scalp and hair, but because the skin can be sensitive, I always use a 1- to 2.5-percent essential oil dilution. Rosemary (chemotype verbenone) is a must-include oil in a scalp massage blend. Add 10 drops of rosemary ct. verbenone into 1 oz. of argan oil—for thick hair, and pomegranate seed oil—for thinner locks. Massage well into hair focusing on rubbing the muscles where your skull and vertebrae meet and let it soak for an hour. Do note—essential oils latch strongly onto hair. Essential oils are great natural alternatives to chemical synthetics found in many commercial beauty products. Our face requires extra TLC since the skin is more sensitive than other parts of the body. If you have sensitive skin, stick to a 1 percent dilution, which is about 4 essential oil drops per carrier oil ounce. If your skin is nonreactive, you can up the dilution to 2.5 percent, which is approximately 10 essential oil drops per carrier oil ounce. How-to: Open your third-eye chakra using spiritual oils that also slow aging, balance sebum production, and improve tone. Add 5 drops frankincense, 3 drops carrot seed oil, and 2 drops german chamomile to 1 oz. of gentle evening primrose oil. Use this centering and skin-firming blend after cleansing. Who hasn’t suffered from a deep chest cough and runny nose? Essential oils are handy in a chest rub when battling a cold, especially since many like eucalyptus contain anti-inflammatory, antispasmodic, anti-tussive, decongestant, and mucolytic properties. Got a sore throat and postnasal drip? 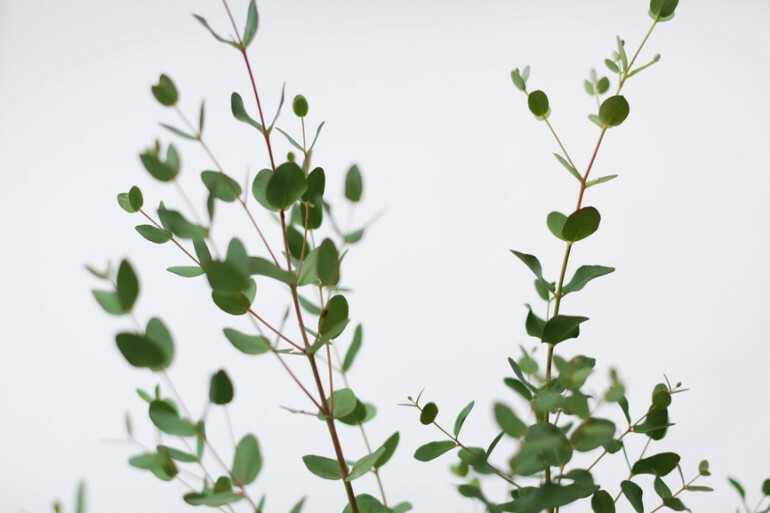 When you feel like you’re coming down with something, reach for the tea tree and eucalyptus. How-to: Kick your respiratory sickness to the curb with your own 2-oz. chest salve. Melt ¼ oz. beeswax and ¼ oz. vegetable oil of your choice in a double boiler. When melted completely and stirred well, take the mixture off heat and add 22 drops rosalina (a powerful mucolytic), 16 drops green myrtle (anti-catarrhal and expectorant), and 12 drops blue gum eucalyptus (decongestive and antitussive). Let the synergy harden and use generously at the onset and during coughs, colds, and flu. Consider yourself an avid texter? Spend much of your day typing emails? It’s suspected that increased use of technology has led to a rise in neuropathies—the most common being carpal tunnel syndrome, which affects forearms and hands. How-to: Give your arms and hands a break with an anti-inflammatory and pain-relieving massage blend. For a 5 percent dilution, add 15 drops cypress, 6 drops helichrysum, and 8 drops roman chamomile into 1 oz. of healing tamanu oil. While clinical researchers debate the effectiveness of dabbing odor molecules where your heart rate can be felt, I find that applying essential oils at pulse points diffuses the scent, greatly affects my mood. Each night, I apply a sleep blend to my wrists and neck to meditate with before dozing off. How-to: For a good night’s sleep, drop 12 drops lavender and 2 drops vetiver into a roller blend bottle and top it off with 1 oz. of sunflower oil. You can create your own essential oil mood blend and dab it on the wrists, neck, and behind the ears and knees. The abdomen is often busy absorbing and digesting food. Essential oils, like clary sage and ginger, can alleviate indigestion, menstrual cramping, and constipation. Clary sage is a proven anti-inflammatory, making it the choice oil for cramp relief. Additionally, ginger has an affinity for the digestive system—relieving constipation, diarrhea, and even postoperative and drug-induced nausea. How to: Create a 5 percent dilution by adding 20 drops clary sage and 10 drops ginger into 1 oz. of jojoba oil. Rub gently on the stomach and lower abdomen when overcome with cramping or irritable pain. In many ways, legs are the workhorse of the body and we often forget about all they do for us. Essential oil blends can be kept at a higher 5 to 10 percent dilution because of legs’ thicker skin. If you are looking for an energetic pick-me-up, rub the blend on acupressure point ST36 (Leg Three Miles), which can work actual wonders on fatigue. How-to: Replace your commercial body moisturizer with a comforting body oil that rejuvenates leg muscles. Add 13 drops marjoram, which works wonders for tired muscle aches, 10 drops palmarosa, and 3 drops neroli into 1 oz. of sweet almond oil. For localized pain, substitute no more than 2 drops of potent analgesic wintergreen or precious neroli. Essential oils applied on the soles of feet do not magically cure colds or other ailments. Additionally, claims that essential oils support immunity when paired with reflexology are not evidence-based. Our feet sweat and boast the body’s slowest absorption rate, but it’s not a waste to use essential oils on feet. How-to: Bugs seem to fancy me, and I always get bitten on the tops of my feet and around my ankles. Most healthy adults can use a drop or two of undiluted essential oils for itch relief. If you’re bit by a mosquito or other bug, and there’s no open wound, drop some tea tree, lemongrass, or lavender right on the bite. The heart is the most important human organ. Without it pumping, we couldn’t sustain life. Many are mindful of how diet and exercise affect heart health, but aromatherapy offers complementary support with essential oils. Throughout history, aromas have been used to emotionally and physically care for our hearts. Recent research confirms what many have intuitively known about aromas and essential oils. Essential oils may prevent heart disease, and exposure to aromatherapy has demonstrated a beneficial effect on heart rate and blood pressure. One study in young women showed an association between essential oil inhalation and lower blood pressure, pulse rate, and stress level. Beyond physiology, heart is the home for feelings. Our hearts know—beating faster when reunited with a loved one and sinking into our chests upon hearing bad news. Joseph Campbell wrote, “The goal of life is to make your heartbeat match the beat of the universe, to match your nature with Nature.” Whether you are looking to boost circulation, connect deeper with a lover, or find peace in grief, you can use nature to support your heart. It’s February, the month of love, so here are some ways to emotionally open your heart and physically support its functioning using essential oils. Historically, juniper was used in Europe as a restorative tonic. The essential oil is extracted from berries producing a piney, fruity aroma. It is a powerful detoxifier that aids in improving circulation—making it suitable for those with hardened arteries or heart problems. Juniper acts on the body’s warm yang energy, helping to overcome physical heart problems and break through psychological stagnation. How to: Get your heart pumping healthily with a stimulating body oil. Add 2 to 3 drops in a 1-ounce carrier oil, like sunflower and rub all over your body after showering. Give special attention to rubbing the oil on your chest to boost blood circulation. The rose has been given the power of healing and soothing the heart. In fact, the word rose comes from the Greek word rodon, meaning red. Its floral, feminine scent is heart centering, making it the queen oil for grief and bereavement. Rose comforts in dark times of emotional pain and shock. How to: Rose is a precious oil—a little goes a long way. When confronting unbearable loss, just smell rose essential oil. You can place a small drop on your palm and inhale, or just smell from the bottle. The energetics of the aroma itself is enough to open your heart to connect with love that is, was, and will be. Want to enhance your sensuality? Reach for sandalwood. For years, its woodsy, balsamic aroma has lured men and women alike. It’s a potent aphrodisiac that cultivates a spiritual inner awareness, which makes it perfect for intimately connecting with a partner. How to: Spice things up with a sandalwood massage blend. Add 2 drops to 1 ounce of a skin-friendly carrier oil, like sesame. Use generously on a partner or try your hand at a self-massage, like abhyanga. Native to the Philippines, elemi essential oil is distilled from a tree’s resin. Its fresh, slightly spicy aroma supports and uplifts. Morphologically, tree resin acts as a Band-Aid. Similarly, elemi is a wound healer that supports the cardiovascular system by neutralizing stress. Just smelling it repairs your spirit, which allows you to find compassion in your heart. How to: Place 3 drops on a cotton wick and insert into an aromatic inhaler. When your patience is being tested and you’re overwhelmed, reach for your inhaler and wave it under your nostrils to melt away stress and tap into empathy. Also known as immortelle, helichrysum can mend your broken heart. One of the most powerful all-around healers, it inspires forgiveness. The herbaceous aroma balances the psyche making it the best oil for mental unrest and old emotional scars. Helichrysum has the power to break through the deepest, most “stuck” negative emotions and can restore compassion for oneself. How to: Like rose, it should be used mindfully. If your body physically manifests heartbreak, add 2 drops to a 1-ounce carrier oil and rub it on sore muscles—wherever you need TLC. My go-to carrier oil to support the therapeutic actions of helichrysum is arnica or calendula infused olive oil. Long worshipped by indigenous cultures for its purifying powers, palo santo is sacred. Palo santo oil is said to align with organic life force that banishes negative energy and sparks a reconnection with the heart. It is ideal for those who feel disconnected from their emotions and are longing to reconnect with loved ones and themselves. How to: Diffuse palo santo in your home or workplace. You can also place a drop or two on a warm compress and place it over your forehead or chest when meditating or relaxing. After trauma, cape chamomile can foster feelings of acceptance. Its apple-like scent inspires moving on with life. A spiritual oil known for healing the heart, cape chamomile pacifies anger and aggression. How to: To embody moving on, start a new self-care routine. Make your own face serum by adding 3 drops to 2 ounces of a gentle carrier oil, like rosehip seed or evening primrose into a dropper bottle. The most aromatically pleasing of the chamomiles, it’s ideal for skin care due to its anti-inflammatory properties.